I have set of Johnson Brothers dinnerware, but I noticed that your list doesn't include the pattern I have. It's called "Old flower Prints". I can't find much information on this pattern, and it seems to be rare. I'd appreciate if you can give more information on this pattern. That is an awesome set. 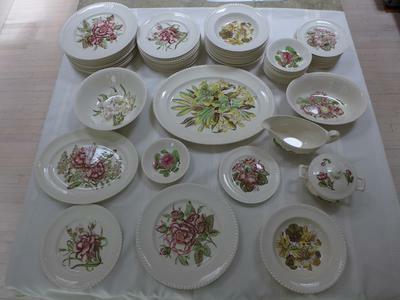 It is rare to find a complete set, but it is still available piece by piece if you need to replace any of the dishes. This pattern was produced in England. The Johnson Brothers Old Flower Prints pattern was in production from 1941 to 1948 according to trusted sources, Replacements and Robbins Nest. I have seen it stated that it was made in 1950, but I don't think so. To learn more about Johnson Brothers dinnerware patterns, Collector Guides are always good. I know this pattern in listed in the 2003 guide by Frederiksen and Page. Thanks for writing in and sharing your collection with us. It is a beautiful pattern.